Anne Holt is another Scandinavian author whose books have been translated out of order. Unlike some writers however, such as Jo Nesbo and Liza Marklund, it does make a significant difference to the sense of the narrative. In 1222, detective Hanne Wilhelmsen is in a wheelchair and reference is made to children she has had with her partner, Cecile. In Death of the Demon, the catastrophe that clearly befalls Hanne has yet to occur and part of the narrative is given over to a heated debate whether she and Cecile should have children. It’s quite frustrating for the reader who knows future plot lines, although my guess is that the success of 1222 is responsible for the earlier, and slighter, books now being translated into English. Like the previous novel in the series, Blessed are Those Who Thirst, the book resolves around a single issue: in this case a damaged child who may have been involved in the murder of a social worker. Olav is grossly overweight due to poor early childhood and he is sent to group foster home which he immediately hates. When the home’s head, Agnes Vestavik, is found with a knife through her heart, Olav is discovered missing although Hanne is reluctant to lay the blame immediately on the absent child. Agnes appears to have dug out secrets of other carers in the home and the identity of the murderer remains unclear. 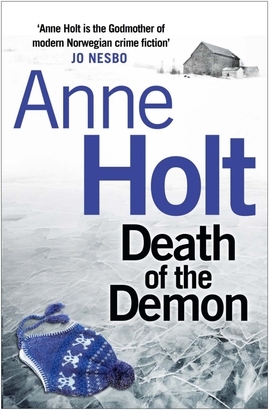 One of the attractions of Anne Holt’s books is that they’re not the huge tomes that characterise much of Scandinavian crime fiction. In many ways they remind me of the books I read as a teenager, with a single plot strand and a tight narrative structure. And I do still enjoy reading this style of book but my problem with Death of the Demon is that the plot is very slight. A woman is killed; a boy runs away. And that’s about it. We get to see slightly more of Hanne’s character but compared to the series’ excellent debut, The Blind Goddess, and the atmospheric 1222, this book pales in comparison. It was a decent enough read but nothing more. And I’ve come to expect much more from crime fiction these days. And perhaps the length of novels is a reflection of this. I’m sure Holt’s fans will read the book anyway. We already know that this is a series on its way somewhere and I’m not giving up on it. But fingers crossed that the next one will be more substantial. The translation, incidentally, by Anne Bruce, is wonderfully clear. Probably wise. I think you’ll enjoy The Blind Goddess. Sarah, I don’t usually disagree with anything you write. I do think this analysis of Death of The Demon is a little harsh. The plot is in my opinion a lot more complex with several interesting backstories, but without a lot of the extraneous padding that features in so many books published today. We should remember that this is a police procedural novel which was written in 1995, before the current trend to produce 600 page doorstops. Hi Norman – well maybe I have been a little harsh. Glad you disagree. The length of the book was an attraction for me to be honest but I was left feeling disappointed. I hadn’t realised it was written so long ago. I have not read this author, but definitely will read the Hanne Wilhelmsen series in order, when I get to it. I have Blind Goddess on the Kindle and have had the first in the Vik/Stubo series for a while. I should try one of them. In 2014. I like the idea of shorter books in this series. Yes, me too Tracy. That said I’ve just put down a shorter book I was reading as I wasn’t enjoying it. It’s ultimately about the quality. I like this series so much, and like many, began with 1222, then read The Blind Goddess. But there’s a second good one in the translated books called Blessed Are Those Who Thirst. That is told from different points of view. It’s unputdownable. This discussion prompts me to read Death of the Demon, which is sitting atop my TBR pile, but hasn’t yet been read because books keep flying in here from all directions and the stacks keep growing. I enjoyed Blessed are Those Who Thirst, Kathy. Do come back and let me know what you thought of Death of the Demon. My first Anne Holt, and I found it really disappointing. So many interesting threads left dangling. I completely agree with Sarah. A lot of nothing. Hi Ann-Louise. Thanks for coming by and commenting. Some of Holt’s later books are good. In particular 1222. But this one is very slight indeed.